Geist! 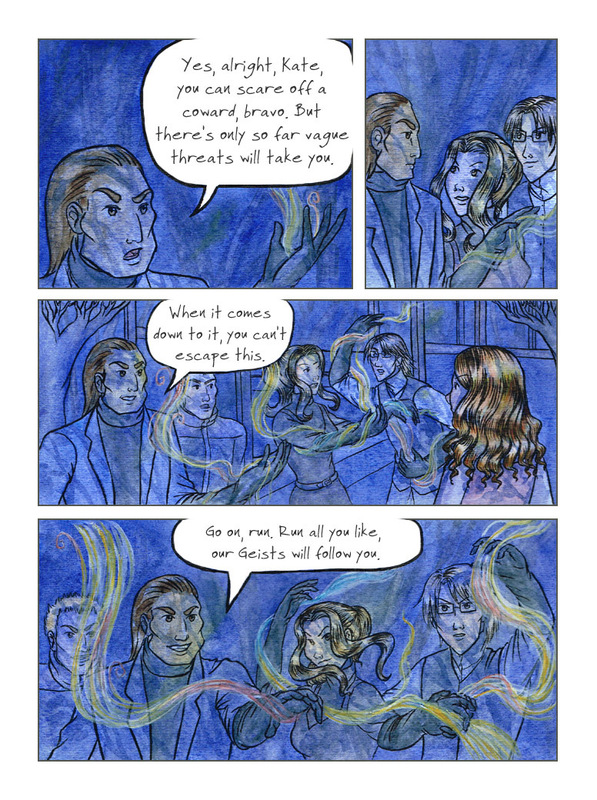 Page 296 – Geist! It sure looks like the Geistlords can see the geists, but I thought that was Kate’s special ability. I also thought that touching a geist was what got Kate in trouble in the first place. I’ve been reading the story for a long time. The Geistlords wouldn’t need to see their geists to know where they are, given that they’re guiding them… as for Kate’s curse, that was caused by something more extreme than touching a geist (coming into contact with water where a geist has died). I’m surprised that the geistlords are giving Kate so many opportunities to disrupt them… allowing her to make a big speech insulting them to their face, then offering her plenty of time to run to wherever she wants. I suppose this is a show of weakness on their part / they need her to show weakness herself before they feel comfortable attacking her?